Were Major Media Outlets Including Huffington Post Fooled By Halford/Lady Gaga Prank? A Tyranny of Tradition prank might have claimed yet another series of new victims. Back on April 28th 2014, this website ran an article claiming that the new Judas Priest album, scheduled to come later this year, was a hoax. The album, of course, came out in July. Tyranny simply meant to write satire to confuse and amuse the metal loving masses. However, this time, things might have gotten out of control. In a recent interview with The Huffington Post Canada, Rob Halford discussed a possible duet with pop star Lady Gaga. While Halford’s love of Lady Gaga has been known for over four years, there is an eerie similarity between the Tyranny article and the Huffington Post interview conducted days earlier. The interview with Halford has been picked up by many major media sites including The CNN of Heavy Metal Blabbermouth.com. Tyranny of Tradition writer Keith Spillett has not been able to be reached for comment. There is no Overman…only an Outerman. We are The Outerman. They are The Innerman. Made from the same material. Subject to the same illusion. The two share nothing in common beyond circumstance. The Outerman does not stand above the world of The Innerman, rather we are mired in it. We watch its absurdities not from a distance, but from a terrible proximity. We bare the scars of The Innerman’s creations. We live in the demented cesspool of their need for acceptance. Adoration that will never come from the other Innermen. They are blind. Each alone in the company of Others. Each pantomiming human form. Each actors on a stage that stretches from dawn till death. Both The Innerman and The Outerman are prisoners of the same sickening carnival, the only difference between the two is The Outerman recognizes it to be what it is. No superstition can save him. No machine can revive him. He walks to his fate with the dignity and honor of a man who will not accept the debasement of delusion. The Outerman looks in the mirror and sees a product of alienation. An alien in a world of aliens. A jigsaw piece that does not fit. Awake among dreamers. There is no Hollywood ending for him or anyone else. There is only decay. The Innerman looks in the mirror and hopes somehow to mold his face to the reflect the blank stare of the other Innermen. He can never get it right no matter how hard he tries. Never fast enough, never strong enough, never smart enough. Everyday he hopes he’ll see a different image in front of him. If he could just find the formula. The Man With The Answer. But there is no Man and there is No Answer. The Innerman’s world is one of violence. Violence not in the sense of harm towards others (although some choose that path), but a violent ignorance that turns a blind eye to the suffering in their midst. The Cause portion of the equation forgotten. The Effect always a mystery. “Why do they hate us?” they wonder aloud, never seeing the answer apparent to anyone not forever trapped in fantasy. Violence is the righteousness of the provincial and the tyranny of the obvious. The world of the Innerman is a dream inside of a dream inside of a dream, with a waking nightmare always somewhere in the corner of his eye. The Innerman is doomed. Even God won’t save him. Why would He bother? He is too busy poisoning children with cancer, creating horrors like ebola and teaching his followers to hate that which makes them human. He is the God of letting good things happen to bad people and bad things happen to good people. He is not The God of Love, He is The God of Pestilence. The best thing God could be is a fantasy. For if he is not, He is a sadist. Both The Outerman and The Innerman are bound together. They walk to the same gallows, suffocated by the same rope. The Outerman calls it a hanging. The Innerman calls it salvation. Reunited rockers Rage Against The Machine have taken another bold stand against capitalism by re-signing with revolutionary record label Sony. The multinational corporate giant has made no secret of their hatred of consumer capitalism and plan to help Rage Against The Machine lead a worker revolt that will bring the current world order to its knees. Guitarist Tom Morello announced their act of rebellion only moments after introducing the strongly anti-capitalist rock band Kiss during their induction to the Rock’N’Roll Hall of Fame. Kiss, who has refused to sell their lunchboxes, toys, and tee shirts to anyone who openly opposes the Zapatista revolution in Mexico, plan to release an anti-capitalismcore album called “Rockers of the World Unite” through Sony in the fall. Morello’s contributions to the revolution have included contributing to the soundtracks of Talladega Nights: The Ricky Bobby Story and The A-Team movie. He and bandmate Zach de La Rocha’s music were also a part of the Trotskyite videogame Guitar Hero. 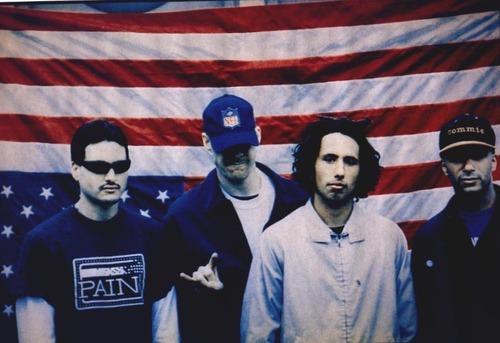 Rage Against The Machine’s vitriolic stand against capitalism in all of its insidious forms has even managed to infect the iPod of former Republican Vice Presidential Nominee Paul Ryan, helping him through many difficult workouts. Sony’s President Ron Boehner has made no secret of their support for “legends of anti-capitalism like Norm Chomsky and Erma Goldman”. Sony’s corporate vision includes turning all of their factories over to the workers by the year 3071 and helping to open more coal plants to slow the effects of global warming. 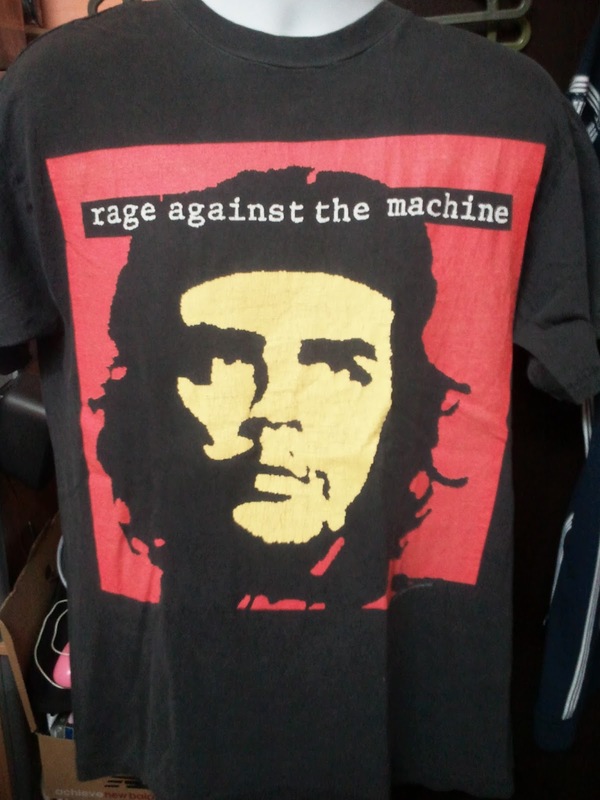 Tom Morello’s side project, Rage Against The Washing Machine Sponsored By The Whirlpool Corporation, are known for their rock covers of Pete Seeger and Paul Robeson songs. They are currently touring malls throughout the Midwest. In The Hallowed Halls of True Satire, no comic acts have attained the lofty heights that Manowar has reached by accident. 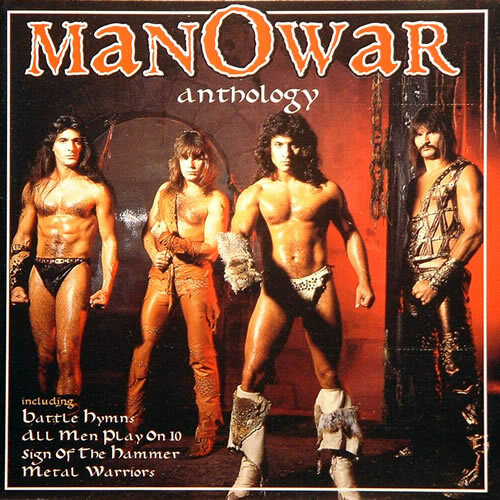 Charlie Chaplin, Abbott and Costello, The Three Stooges, Richard Pryor, Eddie Murphy, George W. Bush….no one is on par with Manowar. It’s not even close. An odd mixture of Goebellsian fascist imagery, arrested pre-teen angst and Rodgers and Hammerstein, Manowar have created an act that aims to stretch the boundaries of the absurd far beyond their breaking point. The sheer earnestness with which they fight for a cause that is not really being threatened is breathtaking. They are defenders of a faith that no one has. Protectors of a mythos so silly that it is hard to imagine that they can stand on stage for an hour and a half without breaking into fits of laughter. Yet they soldier on, without a hint of the joke that only they do not get. If you’ve been to a Manowar show, you know what I’m talking about. 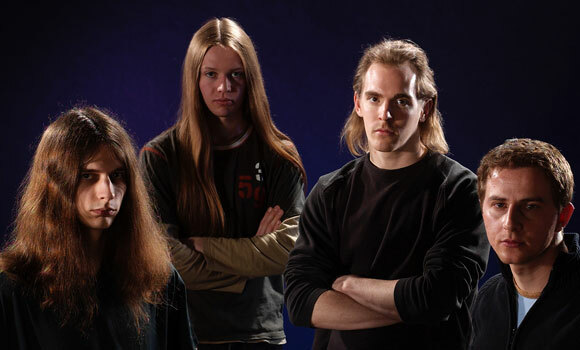 What can be said of a band whose claim to fame is playing at a volume so beyond the limits of what the human eardrum can handle that one would think they were part of a secret government conspiracy to infect all metal fans with tinnitus? When I saw them, every one of the 300 or so fans around me had their fist clasped within their hand waiving it in a salute called “The Sign of The Hammer”. Mussolini couldn’t keep a straight face. Yet somehow, Manowar does. 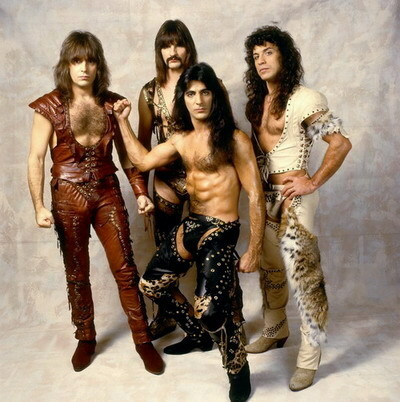 Joey DeMaio, the band’s bass player and spiritual center, actually came out when I saw them and read this rambling, demented love letter from a fan about the life-changing power of Manowar’s music. Even the most devout, snake-passing evangelical would chuckle at this trick. Yet somehow, Manowar does not. The case for Manowar as the greatest comedy act is easy to make. Anyone who has listened to them can easily tick off some of the highlights. Who can forget the “letter they wrote to ‘The MTV’ and the Radio (singular)” where they say “What’s going on? Don’t you care about me?” Or the thrity one second note Eric Adams warbles through at the end of “Black Wind, Fire and Steel”? Try the Manowar drinking game sometime. Listen to their whole discography in order and take a shot every time the words “fire” or “steel” appear in a song. You will be unable to drive halfway through “Battle Hymns”, unable to walk or speak by “Fighting The World” and by the time “Triumph of Steel” comes around, there is a good chance you’ll be in a coma. If you can’t see the sheer comedic genius in this, the last few pieces of evidence should seal the deal for you. Forget for a moment that they continuously encourage “wimps and posers to leave the hall”. Forget that within the first minute of the song the Disneyesque lyric “there’s magic in the metal, there’s magic in us all” appears. They build the song to a dramatic verse which ends with the unfathomable words “got to make it louder, all men play on ten, if you’re not into metal, you are not my friend”. In case you missed it the first time, Adams howls the same verse at the top of his lungs only seconds later. There have been many poignant tributes to the plight of Native Americans. This is not one of them. I’m not sure what kinship Manowar feel with Native Americans. They both have long hair. That’s all I can come up with. Still, that doesn’t stop Eric Adams from punctuating the chorus with a ridiculous made-up Cherokee war cry without a hint of irony. Or from screaming “Let The White Man Die!!!”. Are they aware that they are white? Probably not. This is Custer’s Last Stand and they are Sitting Bull and his army of Lakota Warriors. They have taken this bizarro fantasy so far that they are actually capable of believing it. If you ever want to illustrate Manowar’s talent for ridiculousness to the uninitiated, this is the song to do it with. Long before they were rallying Native Americans to slaughter white men, they managed to write a song meant to highlight the horrors experienced in the 1970s during the mass suicide by Jim Jones’ People’s Temple in an event known as The Jonestown Massacre. There is only one Manowar. They are a gift from The Gods of Heavy Metal to remind us of the feats men can achieve when completely detached from reality. “It happens everywhere. 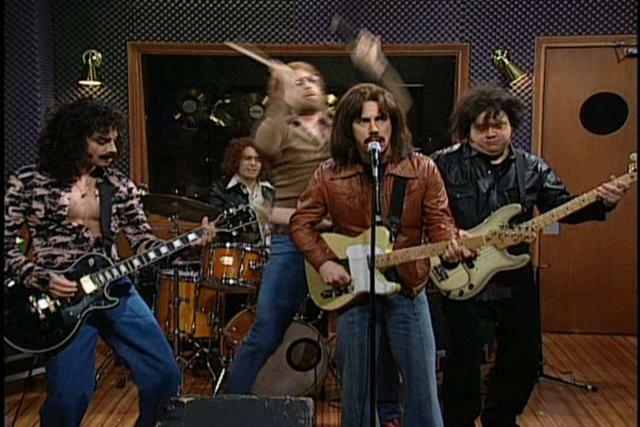 I’m at my proctologist the other day and the guy keeps shouting “More Cowbell” during my exam. At funerals, people come up to me as I’m leaning over the casket and shout ‘More Cowbell’. At a concert on Tuesday night in Akron, Ohio, things got out of control. The audience began screaming “More Cowbell” at the opening act “Yah Mo B There”, a local Michael McDonald cover band. 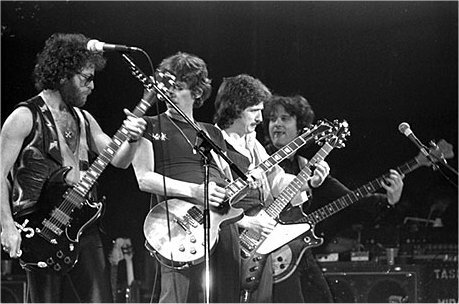 Before Blue Oyster Cult came onstage the crowd chanted “More Cowbell” for nearly an hour. During every single song, the audience howled “More Cowbell” accompanied by raucous laughter. One fan, Zelmo Beaty, shouted the same line in a Christopher Walken voice for the duration of the show nonstop. The band had heard enough. They decided to take action. They leaped from the stage taking drummer Jules Radino’s cowbell, held Beaty and took turns beating him over the head for five minutes the instrument, Dharma was heard shouting “How funny is it now?!!! You want anymore cowbell?!!! !” as security wrestled the bloodied cowbell from his hand. Beaty emerged from his coma on several occasions rambling about how funny he thinks Jimmy Fallon is, how much he loved the Hunger Games series and how he thought Miley Cyrus’ public display of twerking was inappropriate. No charges have been filed against the band by local law enforcement. 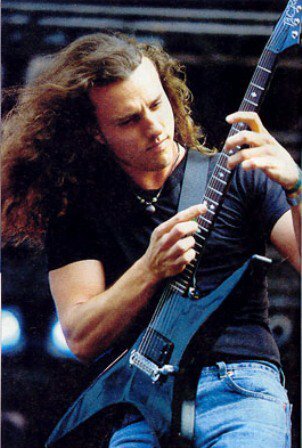 Back in June of 1995, I was lucky enough to have met and spoken with Chuck Schuldiner. Myself and several friends were at a Death concert at The Roxy in Long Island and through a bizarre series of events we ended up on their tour bus. Meeting Death was, for me, the equivalent of what I imagine Christians might feel having been in the presence of Christ. Seriously. For me, Death albums were transcendental experiences that explained most of the mysteries of the universe. Chuck was a mystic to me, Gautama with a guitar, The Great One sent down the mountain to help us see the invisible boundaries that we have created to lock away the most creative, life-affirming aspects of our being. I’m sure I made a total fool of myself. I was your average 13-year-old girl getting backstage to meet Justin Beiber. I was stumbling around for words. Saying anything that came to mind to try to prolong the time we were in the man’s presence. It was actually an uncomfortable feeling in retrospect. I didn’t want to mess up my one shot at actually asking the man the questions that had plagued me for the entirety of my being. This man had answers. No one could create like he did and not hold the key within him. Finally, I worked up to asking him the meaning of the song “Vacant Planets” off of the album “Human”. I had somehow worked up a theory in my mind that this song was a comment on the nature of reality and life itself. I had pondered this song for hours and hours. Understanding its meaning consumed me. There was something to the urgency of this song. It demanded to be understood. There was something deeper to it. Beyond meaning. Beyond rational thought. If he could just explain it to me, I’d have found the missing piece that explained this demented jigsaw puzzle I was living in. During this whole disjointed explanation he regarded me with a great deal of kindness. He had a very empathetic expression. He was listening. He understood. He looked composed his thoughts for a second and looked away. I felt embarrassed. Had I said too much? Had I wasted my moment? Then, he looked back at me. Stared directly into my eyes with a half smile on his face. If there ever was a testimony to his genius, it was that answer. Game of Thrones writer George R.R. Martin and progressive death metal rock and roll band Necrophagist will be teaming up on what some are calling a “dream collaboration”. An album, featuring Martin’s lyrics and the music of Necrophagist, is in the first stages of being created. 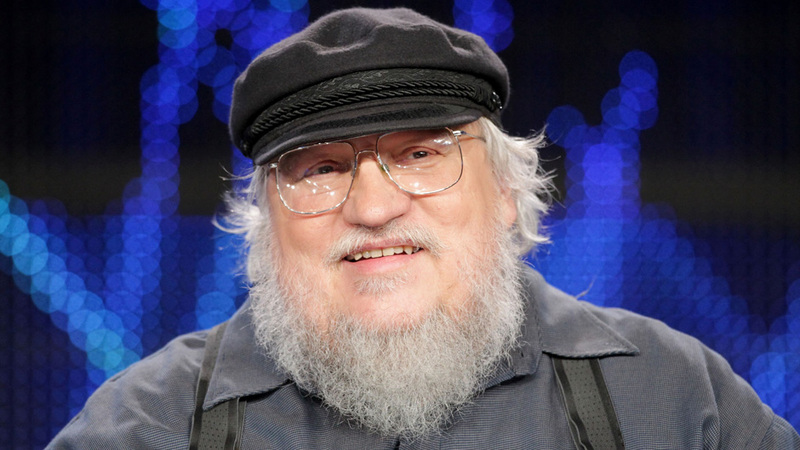 This news delighted the many fans of Martin’s books (as well as the hit HBO series based on his work) along with metal fans who have waited for years to a follow-up to 2004’s Epitaph. The album, which the band plans to name sometime by the year 2074, is expected to be a reflection of the many progressive influences they have picked up in the 70 years between their last album and the naming of the new one. Martin, for his part, is expected to have completed the first verse for the opening track by 2098. While many fans are excited about the project, concern about the band and writer being able to hold up under the rigorous demands of the aging process have made others leery of ever seeing the project’s completion. After all, both the band and Martin will be over 1000 years old by the time the record comes out. Luckily, science has again saved the human race from the perils of inconvenience. 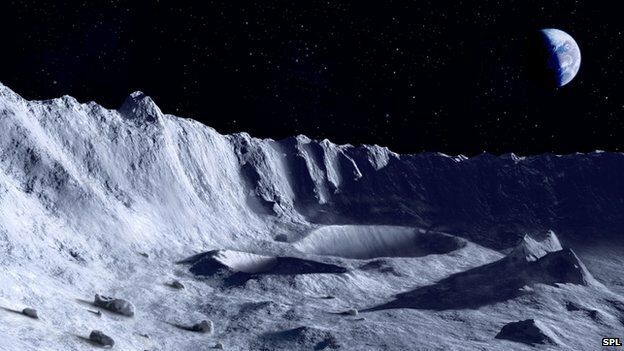 After years of tests on mice in a secret military lab in the foothills of Montana, a process known as partial nano-cryogination is ready for use on humans. Martin and the members of Necrophagist will be the first test subjects. They will be shrunk to three feet tall and stored in a device that resembles a mini-refrigerator. Their body temperature will remain stable at around 56 degrees Fahrenheit. They will be brought out of their frozen coma one hour per day to work on the project. While the process will slowdown the bodies aging process to nearly a crawl, it will also limit the speed of motion of the human subjects. This is why the band could not commit to the record label’s demand of a new record by 2700. Martin has yet to hint at the lyrical content of the album, but many industry insiders believe all the members of the band will be killed off by Martin well before the albums completion. Still, hopes are riding high that the great-great-great-great-great-great-great-grandchildren of these two talented artists will live to see this record digitally implanted into the minds of the surviving members of the human community by their robot overlords well before the year 4000.